Cooking without a Net: They're on the Way! My nephew called a little while ago--he and my brother are on their way! They're driving up from Austin so they'll get here some time tomorrow night. Which is good because I still have some cleaning to do. It will be so good to see them. I don't think I knit a single stitch yesterday, other than fixing some student problems. I did sew about 3/4's of one sleeve of Mavis. I met some friends for a light dinner in the late afternoon so we could see each other before Thanksgiving. That's right--Thanksgiving. It's now less than two weeks away. This afternoon I'm going to meet Mary and give her my scarves for her craft show at work. I'm not expecting anything; that way I won't be disappointed. I don't know if any scarves sold over the weekend at the Austin fair. I'm a little afraid to find out--I don't think any sold. It's Greek Lentil Soup (Faki) and it's delicious. 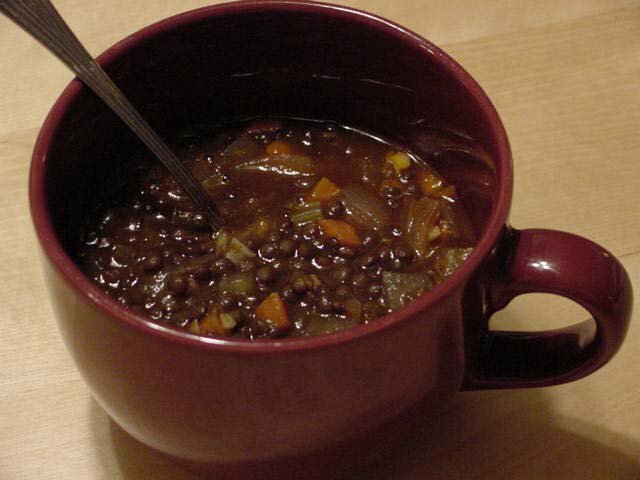 I'm sure it's good with regular lentils, too, but I really like the texture of the black lentils in this. I'll have to get my friend to take me back to Trader Joe's so I can get some more. It's especially good with brown rice. I got some Basmati Brown rice, also at Trader Joe's, and it cooked up beautifully. Brown rice can be pretty tricky but when I followed the directions on the package it came out just right. And now I've got to get busy. I just got a five-box shipment of stuff from my old office that I have to unpack and deal with before my brother and nephew get here tomorrow night. Talk about timing. But tonight's a treat. Tonight some friends are taking me to Opera for dinner. I can't wait! From Beans: More than 200 Delicious, Wholesome Recipes from around the World, by Aliza Green (Running Press, 2004). Place lentils in large soup pot with broth and bring to a boil. Reduce heat and simmer 1 hour, or until tender. Add onions, carrots, celery, garlic, tomato sauce, olive oil, oregano and salt and pepper to taste. Cook for 30 mins longer, or until soup is slightly thickened. Just before serving, stir in the lemon juice or vinegar.